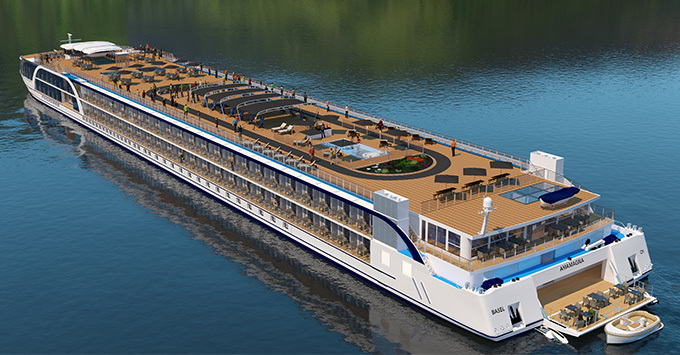 (10:53 a.m. EDT) -- APT and AmaWaterways have put out more details on their new ship, AmaMagna, debuting in May 2019 that will be twice as large as other vessels in the fleet, with a multitude of restaurants, an expansive wellness studio and a water sports platform off the back of the ship. AmaMagna will be 72 feet wide and have 98 cabins, with more than half ranging from 355 to 710 square feet. All cabins will have full outside balconies and bathrooms with double sinks and walk-in showers. Thirty-four cabins will be 252 square feet, while 11 will be 205 square feet. Six Grand Suites (474 square feet) and an Owner's Suite (710 square feet) will be "true suites" with separate seating areas and bathrooms with spa-like tubs. Four restaurants have been announced for the ship. AmaMagna will have the Main restaurant, as well as the Chef's Table -- venues that are already on ships in the AmaWaterways fleet. There will also be an Al Fresco restaurant and Jimmy's Wine Bar, named in honor of the late Jimmy Murphy, one of the line's original co-founders. AmaMagna will also have enhanced entertainment and onboard amenities, including a Zen Wellness Studio with a large exercise area for group classes on stretching, cardio and core strengthening led by a "wellness host". There will be a juice bar and two massage rooms, as well as manicure, pedicure and hair services. The sun deck will have a large heated pool, a whirlpool and a pop-up sky bar. At the rear of the ship, the water sports platform will take passengers on complimentary tours on a smaller vessel. And finally, the ship will offer a special concierge golf program, where passengers can play four top-level courses in Hungary, Slovakia, Austria and Germany. 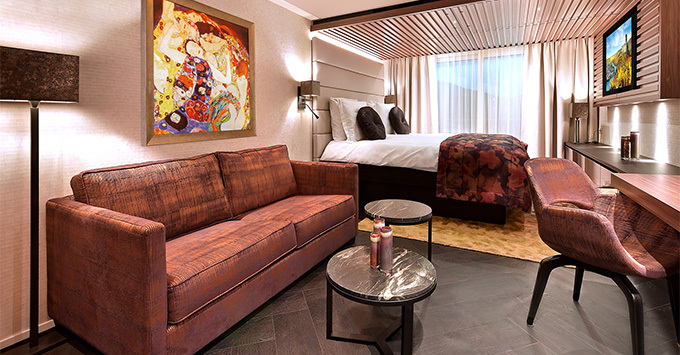 The details released by AmaWaterways show that with AmaMagna, the line is looking to punch into the luxury segment of river cruising, and comments made by co-founder and president Rudi Schreiner back that up. "As the luxury river cruise market evolves, we plan to continue paving the way as an innovative industry leader. While this new concept has been in the works for us for some time, we believe that now is the perfect moment to introduce this very special ship," Schreiner said in a statement. "With more personal space, the freedom of multiple dining venues and exceptional accommodations, AmaMagna has been designed for those seeking a fresh, contemporary and dynamic take on river cruising as well as ocean cruisers accustomed to the luxury of more." While there are limitations to larger river cruise ships -- the locks on Europe's rivers limit the length of most ships to what's become a standard 443 feet long; the width is also restricted to lock size -- the idea of a bigger vessel that has more dining and onboard choices has been catching on. Crystal River Cruises started the trend in 2016 when it refurbished the biggest cruise ship on the Danube, turning it into Crystal Mozart. These larger ships are only capable of cruising sections of the Danube, but happily for passengers, it's the section of the river that encompasses major cultural capitals such as Vienna, Bratislava and Budapest, as well as excursions to Salzburg of "Sound of Music" fame and picturesque Cesky Krumlov. Cruise Critic will be sailing with AmaWaterways next week on its newest vessel, AmaLea, which will be christened on May 26. Stay tuned for updates on the Cruise Critic River forum.